The 84th Division has a history that reaches back to Abraham Lincoln and the Black Hawk Indian War of 1832. The Division patch is a symbol of that legacy and shows an ax splitting a log for a rail fence -- hence the nickname "Railsplitters". On September 20, 1944, the 84th landed in England, trained for a month, then headed for the fighting on the European continent. On November 10, 1944, the Division landed in France and was rushed to the front in Belgium. It was the first unit to smash the northern section of Germany's dreaded Siegfried Line. When the German Army began its last great counter-offensive, the 84th Division again blocked the path. In freezing cold and snow, General Von Rundstedt threw the German Army at the 84th again and again. 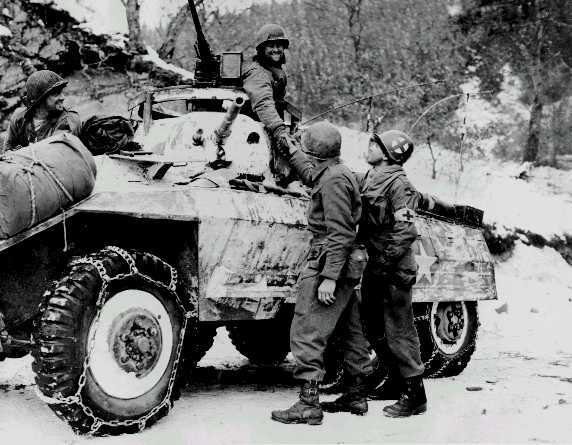 But the Division held its ground in what became known as "The Battle of the Bulge". In November 1944, the 84th moved into Germany and entered combat as an infantry division. Its first mission was the capture of Geilkenkirchen, Germany as part of a larger offensive, north of Aachen. From there, the 84th moved on to capture Boeck and Linden in the face of heavy enemy resistance. The 84th remained in almost continuous action until it reached the Elbe River in April 1945 where it established contact with the Russians at Barlow in May. The 84th has never suffered from lack of battle honors. During World War II, the 84th Division earned 7 Distinguished Unit Citations, 12 Distinguished Service Crosses, 1 Distinguished Service Medal, 555 Silver Stars, 4 Legions of Merit, 27 soldier Medals, 2962 Bronze Stars, and 59 Air Medals.